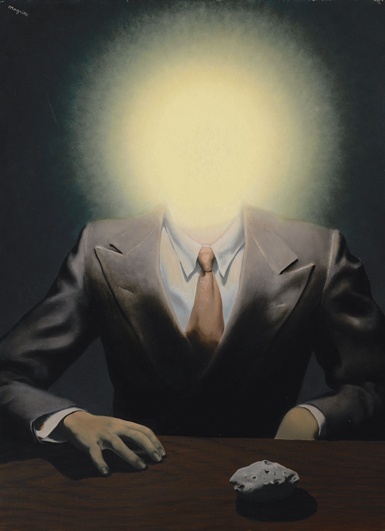 Any thought the art market didn’t have an appetite for works by René Magritte was squelched Monday night at Sotheby’s when the Belgian surrealist’s Le Principe du Plaisir (The Pleasure Principle), 1937, set a new world auction record for the artist, realizing $26.8 million with fees. After a four-minute, seven-way bidding war, in the standing-room only auction gallery at Sotheby’s New York offices, the auctioneer brought the hammer down on a price of $23.5 million. The bidding had pushed the price above an estimate range between $15 million and $20 million. The previous evening, Christie’s failed to sell two works by Magritte, including La statue volante, with an estimate of at least $6 million. Overall, it was a strong night for Sotheby’s, which took in $315.4 million, in a varied auction of impressionist and modern works that resulted in seven paintings selling for more than $20 million. The estimated range for the sale was between $284 million and $393 million for 65 lots. The big disappointment was the failure of Marsden Hartley’s Pre-War Pageant, 1913, to sell. Sotheby’s, which had guaranteed the work would hit an unknown reserve price, estimated the boldly colored abstract in the region of $30 million, and opened the bidding at $20 million. When buyers failed to materialize at $24 million, Sotheby’s ended the bidding. “The market said no,” says Morgan Long, senior director of The Fine Art Group, an independent London-based firm of art advisors and finance experts in Western Art. Long, who had earlier described the painting as a “fantastic picture, incredibly important,” said Pre-War Pageant was her favorite work of the week. If it had sold, it would have blown away the artist’s previous record of $6.3 million, achieved for Lighthouse, 1915, at a 2008 Christie’s auction in New York. The Sotheby’s sale was an unusual grouping of works, including paintings by Egon Schiele and Oskar Kokoschka that had been restituted to heirs persecuted in World War II. Schiele’s Dammernde stadt (Die Kleine Stadt II) (City in Twilight (the Small City II)), 1913, sold for $24.6 million, with fees, after a six-minute bidding war. The painting was estimated to achieve between $12 million and $18 million. Kokoschka’s Joseph De Montesquiou-Fezensac, 1910, realized $20.4 million with fees, five times the previous auction record for the artist. A difficult painting to view by Ernst Ludwig Kirchner Das Soldatenbad(Artilleryman), depicting a crowded shower of soldiers and considered by Sotheby’s to be “one of the greatest painted representations of the psychological realities of war,” sold for $22 million, above an estimated range between $15 million and $20 million. The auction also featured several works by Wassily Kandinsky from a private European collection of fauve, expressionist, and modern works. Three of these paintings sold for more than $20 million, with fees. On Sunday, Christie’s raised $279.3 million in its evening auction of impressionist and modern art, with 85% of the lots sold. While a good showing, the Christie’s results were dimmed by the failure of a few paintings to sell, including Pablo Picasso’s Femme au Beret Orange et au Col de Fourrure, with an estimate of at least $15 million, and Claude Monet’s L’Escalier a Vetheuil, with an estimate of at least $12 million. Image : René Magritte, “Le principe du plaisir (Portrait de Edward James)”, 1937, Oil on canvas, 73 x 54.5 cm. Courtesy Sotheby’s.